1. Heat large nonstick skillet on medium heat. Add mustard seed; cook and stir 1 minute or until fragrant. Immediately pour out of hot pan to avoid over-toasting. Coarsely crush seeds using a rolling pin or a mortar and pestle. 2. Mix mustard seed, vermouth, oil, lemon juice, honey, olive juice, lemon peel, sea salt, garlic and pepper in large bowl until well blended. Reserve 1/4 cup of the marinade for brushing. Place remaining marinade in large resealable plastic bag or glass dish. Add steak; turn to coat well. Refrigerate 2 hours or longer for extra flavor. 4. 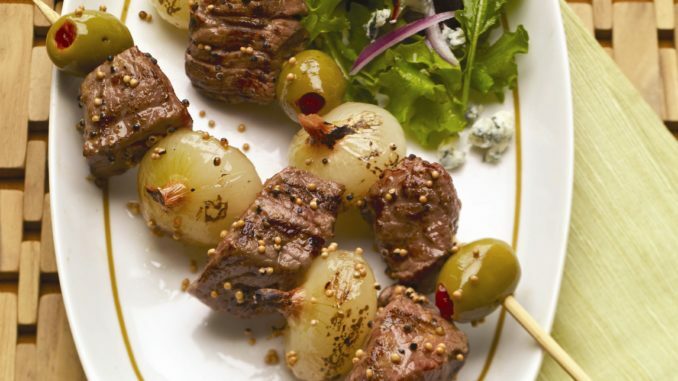 Grill kabobs over medium heat 8 to 10 minutes or until steak is desired doneness, turning occasionally and brushing with reserved marinade.